Even if you don’t know it by name, you’ve probably seen the brush up hairstyle in action. With its uniquely tousled appearance, it’s becoming one of the year’s most iconic mens hairstyles. What is the brush up hairstyle? With a brush up hairstyle, the hair on the top of the head is styled upward in a messy fashion. 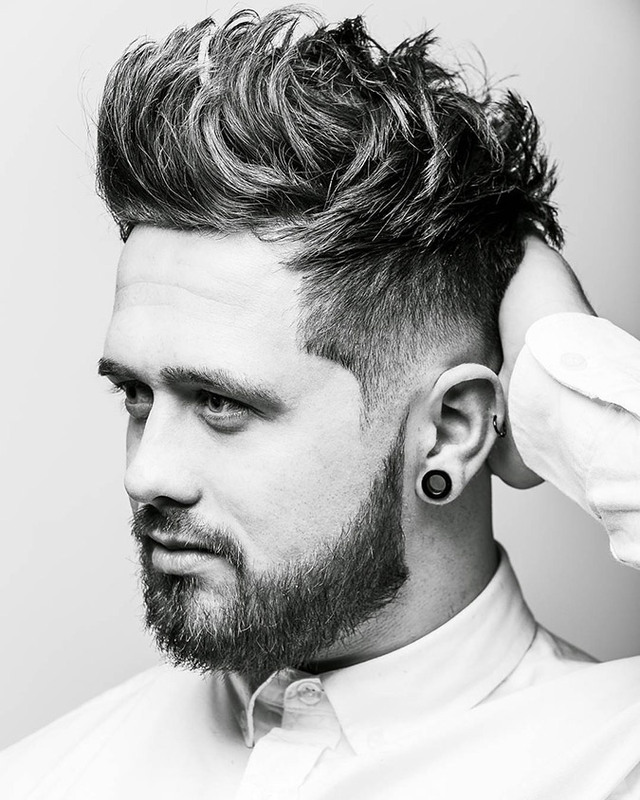 The sides and the back are cut short with either an undercut, fade, or taper. This gives a similar appearance to the quiff. Whereas only the front of the hair is styled in the quiff, the whole top is styled in the brush up hairstyle. What do I need for the brush up hairstyle? You’ll need to make some preparations before getting a brush up hairstyle. First, the hair on top of your head should be 2 to 4 inches long. It can work with slightly shorter or longer hair (1.5 to 4.5 inches), but 2 to 4 inches is the ideal length. This haircut is best for straight or wavy hair. If your hair is curly, you’ll have a hard time getting the brush up hairstyle. Even though the brush up hairstyle is so called because the hair is brushed up, you don’t necessarily need a brush. A comb will also do the job. If you have wavy hair, use a wide-tooth comb. You’ll need some high quality hair wax (or mousse) for this style. Whereas wax will give a messy look, mousse will give volume and works best with wavy hair. Finally, grab a hair dryer. You’re now ready for the brush up hairstyle to grace your head. Start by applying hair wax or mousse to your damp hair. You’ll want to put a nice coat of wax on your hair. Experimentation will allow you to figure out the right amount. As you’re applying the product, style your hair upward. Style it as if you’re spiking it, but make it messy and not defined. You can style it using your fingers and a brush or comb. Now grab your hair dryer and point it at your forelock (bangs). Use your fingers to continue styling your hair upward. The hot air from the hair dryer and the lift from your fingers will provide the main brush up look. After you’ve finished styling your forelock, you can move on to styling the hair on top of your head. Work backward, and repeat the lifting motions while aiming the hair dryer at the hair you’re styling. Continue in this fashion until you’ve got a rocking brush up hairstyle. How to make my brush up right? If you’re not getting a good brush up hairstyle, try styling your hair with a brush or comb instead of your fingers. Depending on your hair type and texture, you may want to use hair mousse instead of wax and vice versa. You might also want to try applying more wax or mousse as you style. As with most hairstyles, experimentation is key. After a bit of practice, you’ll be able to achieve a great brush up hairstyle. 10 Modern Blowout Haircuts: What, Why, How?